If you’re into audio and have spent any time on the internet (which, given that you’re reading an audio blog, seems more than a little likely), then you’ve probably heard that it’s REALLY, REALLY IMPORTANT TO MONO YOU LOW END… (at least, sometimes). Heck, maybe you’ve even watched a few YouTube videos on how to do it, or on what the Top 5 Best Low-End Monoizing Plugins! are. But have you ever asked yourself when, or why, it’s important to mono low frequencies? Or what might make certain plugins better than others? Have you ever thought about how you might go about monoing low frequencies using plugins you already have, and not any specialized ones? If not, you’re in luck, I’m here to guide you through it! And if you have, well then kudos to you! We need more inquisitive, independent thinkers. All the same, have a read. If I’ve missed something you’ve thought of, please let me know in the comments, and heck, you just might learn something new along the way. So, let’s get into it and figure out when, why, and how to Center That Sub! Before we go too far I want to cover some basic definitions to make sure we’re all on the same page. Primarily, what do we mean by ‘mono’, ‘mono-ing’, ‘mono-izing’, etc. In the simplest sense, for a signal to be considered mono in this context it must be identical, or very nearly identical, in both the left and right channels. And that’s pretty much it. There are other ways to express this, although they really only tell part of the story: one would be to say that the left and right channels are in phase, while another would be to say that they are highly correlated. Long story short though, if the left and right speakers are doing the same thing at the same time, then you’ve got yourself a mono signal. Thus, to mono (etc.) a signal is to remove any differences between its left and right components. Ok, great, but why does this matter so much, and why the emphasis on low frequencies? y u no make wide bass? Broadly speaking there are two reasons to worry about the mono status of the low frequencies in your music: 1) vinyl, and 2) single-channel subwoofer playback systems (e.g. many club systems, along with 2.1 and 5.1 home entertainment systems). First, vinyl. Let’s get something out of the way right off the bat: yes, low frequencies with a negative correlation (a.k.a. out of phase, in anti-phase, decorrelated, etc.) can be problematic when cutting vinyl, but a little low frequency width is not nearly as problematic as many would lead you to believe, at least providing it is reasonably well controlled dynamically speaking. Don’t believe me? Check out Scott Hull’s excellent article for Reverb.com on the subject, particularly the Not Every Phase Problem Is a Problem section. Still, if you’re working on music that is eventually destined for vinyl it’s a good idea to at least be aware of what kind of width you’ve got going on below about 200 Hz. If it’s on the subtle side and not overly dynamic you can probably get away with it, whereas sudden bursts of low frequency width are more likely to be problematic. As always, the best advice here is to have a relationship with and consult your cutting engineer. Next up, single-channel subwoofer systems. Note that this doesn’t necessarily mean there’s only one subwoofer, but rather that any additional subwoofers are all being the fed the same signal. For example, many clubs may have an entire row or stack of subs, however they’re certainly not running in stereo. In fact many times the entire sound system is mono to provide a more consistent experience for club goers as they move around, but that’s a subject for another time. That aside, the number of playback systems out there with true stereo sub-bass reproduction is fairly limited, so if low frequencies are going to be reproduced in a predominantly mono fashion anyhow, why not take control of them at the source and ensure they’re mono-ed effectively before they leave the studio? So, what’s an engineer to do? What’s the most effective way to Center That Sub? There are at least a few ways that I’m aware of (and possibly several that I’m not) to convert a signal to mono in a frequency specific way. Let’s go through them in order of increasing complexity, discovering the problems with the simpler cases along the way. Hold on, you have read my Mid-Side, Decoded post, right? If not, this is probably a good time to pause and brush up on that. Go ahead, I’ll wait. Ok, you’re good with transforming from L/R to M/S and back again, and how the phase relationship of side to mid affects stereo placement in L/R? Cool, let’s do this! If the goal when mono-ing a signal is remove any differences between the left and right channels, then a good place to start is to filter out any information we want to eliminate from the difference channel (a.k.a. “side” channel). Said another way, since we’re interested in removing low frequency differences, that means using a high-pass filter on the side channel. As a brief aside, this is what’s often known as an elliptical filter, or elliptical EQ, so called due to its original use in vinyl cutting where stereo signals would cause the cutter head to trace a roughly elliptical path. This should not however be confused with the elliptic filter topology (also known as a Cauer or Zolotarev filter), characterized by equiripple in the pass- and stop-bands and a sharp transition between the two, and which gets its name from the elliptical layout of its poles in the complex z-plane. But enough about that, back to high-passing the difference channel. Here’s the rub: all analog filters, and many digital filters, induce phase shift. In a 6dB/octave filter, also known as a 1st-order filter, the maximal phase shift is 90°. However as filter order increases and the rolloff becomes steeper, so does the maximal phase shift. The upshot of all this is that by using a minimum phase high-pass filter on the difference channel you will be compromising the stereo image at and around the cutoff frequency of the filter. With a 1st-order filter you can just about get away with this. The maximal phase shift of 90° means that while the stereo image won’t flip on you at any point, stereo separation will suffer and there will be some phase differences between the left and right channels. By moving to higher order filters though, image-flip around the cutoff frequency and substantial phase shift between left and right becomes inevitable. There is one very clever exception to this, discussed below in the Processors Under Test section. Linear phase to the rescue! If you’re ok with keeping things “in the box”, then the obvious solution here is to use a linear phase high-pass filter (LP-HPF). And honestly, for the majority of cases, that may work just fine. There’s a possibility that if something in the frequency range you’re mono-ing is hard panned then you’ll lose a little level using an LP-HPF, but usually it’s easy enough to compensate for that with a slight boost at the appropriate frequency in the sum (mid) channel. There is however one scenario in which an LP-HPF will fail, and that’s when a signal is predominantly or entirely in the difference channel. Admittedly, this is a bit unusual, but I have had more than one song come across my desk where this is a problem. It’s not something that can happen through panning alone, and it’s not something you should ever see with a naturally recorded acoustic source, but with synthesized bass it’s not unheard of. When this happens and a simple difference channel HPF is used, whether minimum or linear phase, bass content can be lost entirely. Unfortunately, there’s only one commercially available plug-in that I’ve found which is able to recover purely anti-phase content to mono, and it doesn’t really do it in an optimal way. As such, I’m working on developing a tool that will do this effectively. Finally, before we really dig into the meat of this, there’s one tool I want to make sure we’re all familiar with and know how to read correctly: the vectorscope, or x-y scope. The vectorscope originates from using left and right audio signals to drive a 2-channel oscilloscope set to x-y mode. By doing this you can generate what are known as Lissajous patterns and actually learn quite a bit about the signals being fed to the scope. For our purposes there are four important shapes to remember: 1) a vertical line indicating a fully mono signal, 2) a horizontal line indicating a fully antiphase signal (in other words, left and right are 180° out of phase), 3) an angled line indicating a panned signal, and 4) an ellipse indicating phase shift between the left and right channels, with the special case of a circle indicating a 90° phase shift. For a more thorough introduction to x-y scopes and Lissajous figures, check out this excellent video. signal should again start fully mono before slowly rotating back to a fully antiphase signal. In both cases rotation should be counterclockwise to preserve the integrity of the original signal. Ideally, signals should also maintain their phase relationship throughout. This means that clockwise rotation or elliptical traces in the vectorscope indicate a processor which is operating less than optimally. Ian’s Homebrew: This is a processor I’ve mocked up which exhibits the idealized behavior. Unfortunately it’s not really ready for primetime. I’m looking into partnering with a trusted developer though, so stay tuned for more information and future announcements. This though is the bar I’m measuring other processors against, and the vectorscope behavior and waveforms are good references to compare against. Nugen Monofilter: This comes so close, it’s almost more frustrating than some of the ones that miss the mark completely. It’s the only commercially available processor I’ve found that’s capable of recovering antiphase signals to mono, and features adjustable phase correction controls for signals below the cutoff frequency and even an “auto” mode which can compensate for signals with dynamic phase offset. The problem is that it seems to prioritize the polarity of the wrong channel. This can been seen in the vectorscope as clockwise rotation, and in the waveform view when the left channel flips polarity in the first test signal. Linear Phase High-Pass Filter: If you’re not worried about recovering antiphase signals, then just about any linear phase HPF will do the job. Do watch out for pre-ringing with steeper filter slopes however. Here I’m using Pro-Q2 from FabFilter in Linear Phase mode set to Very High latency, with a 12dB/octave HPF on the side channel. iZotope Ozone Imager: iZotope have wisely used linear phase crossovers in their Ozone Imager product. This means that you can pull the width slider down to -100 on the low band and not worry about any phase or image shift. However again, it won’t recover any antiphase signals. KA-Electronics EEQ-12: Among the minimum phase alternatives, the KA-Electronics EEQ-12 is the standout. This analog DIY device, designed and sold by Wayne Kirkwood, manages a 12dB/octave slope without the negative affects of phase shift usually associated with higher order filters. In a nutshell, he does this by compensating with cleverly designed all-pass filter network. If you’re interested in further reading on this device, you can see the design process here. Worth noting, the EEQ-12 tested uses a cutoff frequency of 150Hz rather than the 100Hz setting chosen for all other processors. Even so, it achieves better separation in both the frequency and stereo spaces, and with less phase shift to boot, than any of its 6dB/octave minimum phase elliptical EQ cousins. No wonder Sterling Sound bough 8 of them when they were first released! Maselec MTC-2: The Elliptical EQ on the Maselec MTC range is a staple in many analog mastering houses. Here, we test an MTC-2 thanks to Mike Hillier at Metropolis Mastering. To be sure, this design was the standard for vinyl cutting for many years and mirrors the design found in older Neumann elliptical EQs, but there is the inevitable phase shift between channels, and the low filter order means that crosstalk extends well into the midrange, compromising the stereo image slightly. Boz Digital Labs Mongoose / TDR SlickEQ Mastering / Sknote Cuttertone: If you want a plug-in version of the Neumann/Maselec style design, these three processors all do a good job, but with the same inherent pitfalls of a 1st-order minimum phase filter. If you’re going for a vintage vibe, they may be suitable, but if you’re after maximum transparency and control, best look elsewhere. Minimum Phase High-Pass Filter: Using a 2nd-order or higher MP-HPF is to start asking for problems. Crosstalk (to the point of image flip) and phase drift between channels become readily obvious. To demonstrate this I’ve used FabFilter’s Pro-Q2 again, but this time set to Zero Latency mode. If you want to use this as a special effect on a particular instrument in a mix, that may be one thing, but in my opinion these types of processors have no place in mastering. Unfortunately, the following three processors all use this technique. bx_control V2: By all appearances this is nearly identical to the zero latency Pro-Q2 implementation above. There’s not much else to say here. bx_masterdesk: As one would expect this is very similar to bx_control V2. The differences here are that masterdesk adds some harmonic saturation, and also has some low-frequency rolloff even when set flat. Klanghelm VUMT Deluxe: I’m generally a fan of Klanghelm plug-ins, but something went particularly wrong here. My guess is a 3rd-order or higher filter which is exaggerating the crosstalk and phase drift. Matthew Lane DrMS: I honestly don’t know what’s going on here. DrMS is neat in that it allows you to convert mid to side and vice versa, and even has filters on each section, meaning you can do this in a frequency specific way, but something obviously went wrong under the hood. 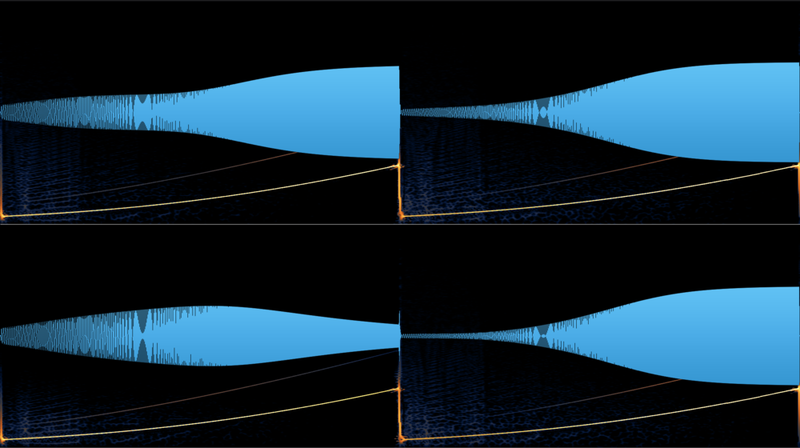 There’s phase shift and substantial filter ripple, but even weirder than that is what I can only describe as some sort of ring-modulation, which is very audible and definitely shouldn’t be there. I know there are other processors I’ve missed that people will probably want to know the results on, but it’s taken me months just to do the write-up on the 13 processors presented here. I even tried to add a 14th I just recently found, but it kept crashing Studio One. Here’s the good news: you can download my test signal here, get the vectorscope shown above for free here, and test any other mono-maker devices you may have. And should you find one that outperforms the others presented in this post please let me know in the comments! If you’re coming away from this feeling let down and like there’s no perfect option for Centering Your Sub, well, I’m sorry. If nothing else I know this has motivated me to find a way to make my homebrew method publicly available. If that’s something that sounds interesting to you please consider subscribing so you can be one of the first to know about any updates. In the meantime though, a linear phase high-pass filter will be good enough in the vast majority of cases, and should you find yourself needing to recover antiphase bass signals to mono, Nugen Monofilter does a pretty good job with just a bit more phase rotation than necessary. Until next time, keep that Sub Centered! Sign up with your email address to receive news and updates (you can unsubscribe at any time). We respect your privacy and will never share, sell, or otherwise misuse your email address. Website Refresh, New Projects, and More!